Usagi Yojimbo is kind of a difficult comic to classify in terms of age appropriateness. As a samurai pulp, it is certainly the most accessible to a western audience of the comics I’ve discussed so far. It lacks the gore and explicit content of “Lone Wolf and Cub,” and its setting is simpler than “Rurouni Kenshin’s” historical period. At first glance, the cartoonish talking animal characters make it seem perfect for younger kids. The first story in this collection even features a guest appearance by the Teenage Mutant Ninja Turtles. But there is something nonetheless unflinching in Sakai’s tales of the long-eared wandering swordsman that resonates with the stark realities of Japan’s Shogunate period. Although this collection is labeled as “volume one,” this collection actually contains parts eight through ten of the series, which is the point where Dark Horse began to publish the collected volumes. Although a great deal of backstory is referenced at times, Sakai is very good at bringing the reader up to speed quickly, and I never felt lost. Following Miyamoto Usagi as he wanders the countryside, the stories in his collection are picaresque adventures that flow organically, and build slowly upon one another. They don’t reach a climax in this volume, but I am quite curious about where Usagi ends up. These stories are by turns exciting, heartwarming, and sad, and they are filled with a sense of wonder and reverence for Japanese culture and traditions. Even though he is of the Samurai class, Usagi’s humility and genuine desire to connect with other people allow him to enter a variety of stories, from a widow struggling to avenge her husband’s death on the gambler responsible to an exploration of traditional seaweed farming. The varied nature of the stories is delightful, but parents might want to read through first, or read with their children to be able to answer some of the difficult issues sometimes raised by this comic. One of the most moving, but also difficult to read stories in this collection is entitled “Noodles.” The story of a mute soba seller and his performer/pickpocket companion, it deals with some very heavy subjects, including justice, or the lack thereof, the rights of the disabled, and capital punishment. While the conclusion to that story is satisfying, it is the darkest point in the book, and it was hard for me to get through as an adult. Sakai’s art is superlative. His style is at once a blend of Carl Barks and Goseki Kojima and something entirely his own, and it is breathtaking. His attention to detail, and his deft depiction of samurai fighting that doesn’t dip into gory self-indulgence is wonderful, and keeps the stories moving while lending them a timeless atmosphere. 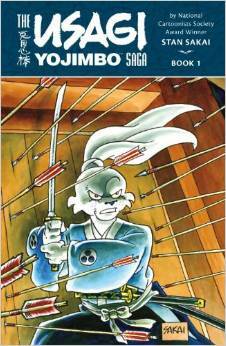 Usagi Yojimbo is an excellent comic for readers new to the genre, or for anyone with an interest in Japanese culture. You can find the first volume on Amazon, or at your local comics shop.